Objectives: The objective of this study is to assess the differences in facial profile preference among different layers of people in the United Arab Emirates. Facial profile self-awareness among the different groups was also evaluated. Materials and Methods: A total sample of 222 participants (mean [standard deviation] age = 25.71 [8.3] years, almost 80% of the participants were of Arab origin and 55% were males); consisting of 60 laypersons, 60 dental students, 60 general practitioners, 16 oral surgeons, and 26 orthodontists. Facial profile photographs of a male and female adult with straight profiles and a Class I skeletal relationship were used as a baseline template. 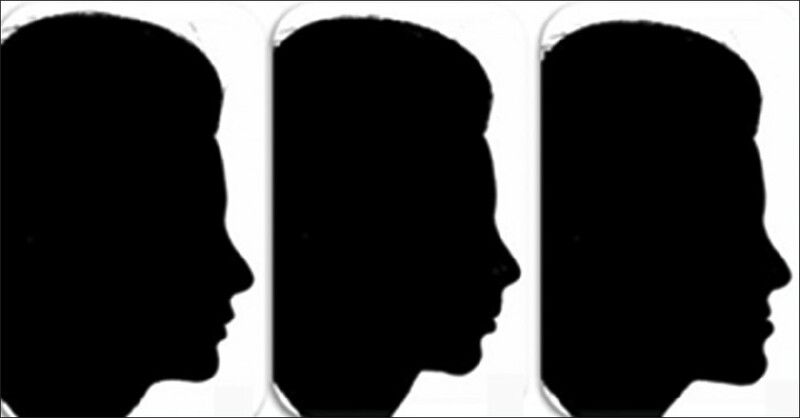 Computerized photographic image modification was carried out on the templates to obtain seven different facial profile silhouettes for each gender. To assess differences in facial profile perception, participants were asked to rank the profiles of each gender on a scale from most to least attractive (1 [highest score] and 7 [least score]). Awareness and satisfaction with the facial appearance on a profile view was assessed using questionnaires completed by the non-expert groups. 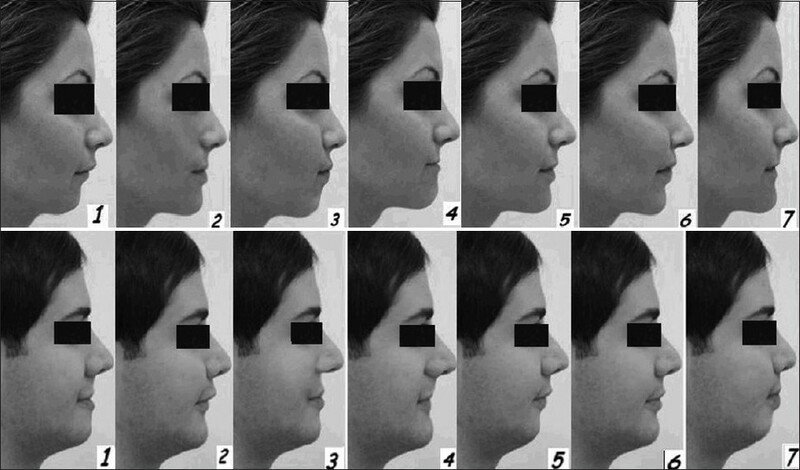 Results: The straight facial profile was perceived to be highly attractive by all five groups. The least attractive profiles were the bimaxillary protrusion and the mandibular retrusion for the male and the female profiles, respectively. Lip protrusion was more esthetically acceptable in females. Significant differences in perception existed among groups. The female profile esthetic perception was highly correlated between the expert groups (P > 0.05). Overall agreement between the non-expert group's perceptions of their own profiles and evaluation by the expert orthodontist was 51% (κ = 0.089). Candidates who perceived themselves as having a Class III facial profile were the least satisfied with their profile. Conclusions: Dental professionals, dental students, and laypersons had a similar perception trends in female and male aesthetic preference. Laypersons were more tolerant to profiles with bi-maxillary retrusion. The expert group's esthetic perception was highly correlated only for the female profiles. Most of the non-experts were unable to correctly identify their facial profile. Despite the similarities, human faces differ, but beauty and harmony remain among the most desired facial characteristics humans seek and long for. Recent studies show that the face plays a key role in the human social interactions. It is therefore of no surprise that people with attractive faces tending to be more socially successful and amiable in life. Psychological benefits of orthodontic treatment, done to improve appearance, revolve around gaining a more positive self-image and more favorable responses in future interpersonal situations,  which can be only achieved if the patient is satisfied after the treatment. Facial profile self-awareness can raise the orthodontic patient's post-treatment satisfaction. This is because their decisions during the treatment plan will also be influenced by their own perceptions once they have become aware of their profiles, hence reaching better satisfaction and indeed a more positive self-image. Hershon and Giddon  reported that candidate's dissatisfaction with their profiles was related to their perceived amount of lip protrusion, which demonstrates the profile self-perception influence on the satisfaction. It has been reported that about half the population cannot characterize their own profiles, and that the educational level was a strong perception-affecting factor. Insightful relations include that of the perceived profile versus the amount of self-satisfaction. Johnston et al. reported that although Class III patients were more concerned and aware of their profile appearance, yet the likelihood to undergo facial profile changes was more evident in the Class II profile patients. The aim of this study was to determine differences in facial profile preferences among orthodontists, oral surgeons, general practitioners, dental students, and laypersons. It was also aimed at finding levels of the facial profile self-awareness among the non-expert groups. This study was divided into two parts; the first part was aimed at finding differences in the perception of male and female facial profile esthetics. The study sample (n = 222) comprised of expert and non-expert groups. As [Table 1] shows, the sample consisted of 60 laypersons, 60 dental students, 60 general practitioners of which 30 were male and 30 were female, 26 orthodontists and 16 oral surgeons. The mean (standard deviation) age of the study participants was 25.71 (8.3) years. Almost 80% of the participants were of Arab origin and 55% were male participants. Profile photographs of a young male and female adults with straight and harmonious facial profile contours, a Class I skeletal relationship and normal cephalometric values; were taken using an Olympus digital camera (SLR E-500, 8.0 Mpx); to be used as baseline templates for profile silhouettes generation. Adobe Photoshop software (CS4 extended version 11.0, Adobe Systems Inc., San Jose, CA, USA) was used to manipulate the templates and generate silhouettes mimicking the existing maxillary and mandibular growth variations. It would be of importance to note that vertical proportions were normally maintained in all images and each image horizontal manipulation did not exceed a single jaw or bi-maxillary dental constituent. Six profile images were generated from each original template. [Figure 1] shows the manipulated profile images included in the study to assess profile perception of study participants. No extreme manipulations were done; thus maintaining more realistic soft tissue facial profiles. The profiles were arranged in a single row; side-by-side, for each gender, for evaluation at the same session; hence allowing fair comparisons to be made. Moreover, profile images order of arrangement for each gender was different to avoid pattern detection. Participants were asked to rank the profile silhouettes in order from the most attractive to the least attractive, assigning a value of 1 to the profile considered "most attractive," ascending to a value of 7 for the profile considered "least attractive." Questions were allocated to collect data on the most influential facial feature in the overall ranking, age, gender and race which may be possible perception influencing factors. In order to check the profile ranking scores reliability, 20 participants from each non-expert group were asked to re-rank the images; 2 weeks after the distribution of the questionnaire for the 1 st time. The intra-raters' reliability was acceptable overall, with an interclass correlation coefficient of 0.911 and 0.779 for the least attractive female and male profile images. The second part of the study was aimed at finding levels of the facial profile self-awareness and satisfaction; among the three non-expert groups, who participated in the first part of the study. The baseline templates were used to generate images of the three ultimate facial profile types, i.e., straight, convex and concave [Figure 2]. The color threshold of the images was adjusted to get black images; allowing the participants to focus on the profiles outline alone, then they were asked to choose, from among various silhouettes the one that they thought most resembled their own proﬁle. Facial profile photographs of the participants were taken to be evaluated by an expert orthodontist; to determine whether the subjects were accurate in describing their proﬁle based on the silhouettes provided on the questionnaire. The ranking order of the profile images was changed in to rank scores to allow proper statistical analysis to be made, which were all done using Statistical Package for the Social Sciences version 17 (SPSS Inc., Chicago, USA). Differences in the profile image ratings among the different experimental groups and pairwise comparisons between the experimental groups were done using the Kruskul-Wallis and Mann-Whitney U tests, respectively. Fisher's exact test was used to detect significant differences in the selection of the most influential facial feature. The kappa's coefficient was used to test the agreement between the candidate's and the orthodontist's profile choices. The relation between the perceived profiles versus the satisfaction rate was analyzed using Kruskul-Wallis test. Statistical significance was set at P < 0.05. [Table 2] shows the mean rank scores assigned to each of the male facial profile types. The attractiveness score of the male profile ranged between 1 (highest score) and 7 (least score). The straight and the bi-maxillary protrusion were chosen as the most and the least attractive profiles, respectively, by all the non-expert groups. On the other hand, orthodontist's and oral surgeon's least attractive profiles were the mandibular prognathism and retrognathism, respectively. Pairwise comparisons between orthodontists and the other groups, along with details of significant differences are highlighted in [Table 3]. Laypersons ranked the bi-maxillary protrusion marginally worse than did the orthodontists; who seemed to be more worried about the protruded chin position. In addition, mandibular retrognathism was perceived to be less appealing by all groups when compared to orthodontists, who found the flatter profile to be significantly less attractive, than did all the other groups did. [Table 4] also shows the mean rank scores for the female profile images. All groups ranked the straight profile as the most attractive. Although the mandibular retrognathism was the overall least attractive profile, orthodontists and dental students chose the flatter profile to be the least pleasing for a female. Results of pairwise comparisons between orthodontists and the other groups are shown in [Table 3]. The mean rank score given by orthodontists to the mandibular prognathism; was about 1 rank score lower than laypersons. Clearly, no significant differences existed among the expert groups, when rating female profile images. Most differences existed between orthodontists and general practitioners. Significant differences existed when comparing the laypersons most influential facial feature versus other groups (Fisher's exact test, P < 0.05); for more clarification, [Figure 3] shows that most participants chose the chin, except the laypersons group who thought the nose was the most influential part in determining facial profile attractiveness. No significant differences related to age, gender and race were detected. 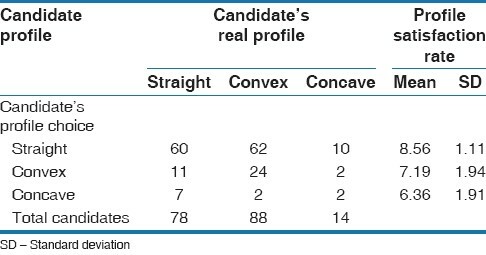 [Table 5] shows that among the three real profile types, most candidates perceived the straight profile as their true profile; when many of them were actually in the convex and the concave divisions. These low levels of self-awareness have been demonstrated more clearly by the low overall κ value (0.089) or level of agreement between the orthodontist and the non-expert groups. In spite of that, general practitioners were still the most conscious of their profile types. Based on their perceived facial profile types, results showed that candidates with a concave profile were the least satisfied [Table 5]. In addition, significant differences in satisfaction rates were found between the straight profile versus both the convex and concave. Yet, none existed between the convex and the concave facial profiles [Table 6]. When the three participant groups were asked if they were willing to undergo facial profile changes; there were no statistically significant differences between the groups (P > 0.05). Therefore, the educational background had no significant effect on the candidate's choice in this part of the study; hence, comparisons between the groups were only based on the perceived profile. 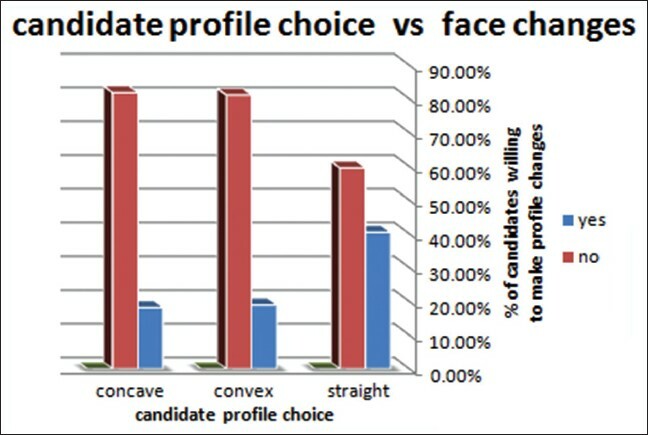 [Figure 4] shows that individuals who thought they had a convex or a concave profile, were more willing to change their facial profile features; to look more attractive. Orthodontic treatment is ideally aimed at attaining a nearly straight facial profile, translating to a facial profile angle of 169°. This treatment intention is further validated by the similarity of perception in our findings; which suggest that both male and female straight profiles were regarded as the most attractive profiles; among both the expert and non-expert groups. Mantzikoz et al. also reproduced similar as the most attractive profiles; among both the expert and non-expert groups. Mantzikos. also reproduced similar findings. Nevertheless, orthodontists still gave higher-ranking scores to the straight profile; than did laypersons. This can be attributed to the influence the educational background can have on a person's perception. Similar patterns of ranking were observed in studies of Soh et al. and Chung et al.,  confirming that educational background influences the aesthetic ranking. Our results confirm that laypersons find a female profile with a retruded chin position very unattractive, whereas orthodontists thought the profile with protruded chin was the least appealing. In both cases, the chin seemed to be the influencing facial feature in their choice, as they have ranked profiles with manipulations done in the mandible; less attractive compared with their complements with maxillary manipulations. These findings are suggest that when judging facial attractiveness, the mandibular position seems to be more critical than the maxilla; implying that in cases where double jaw malocclusions exist, more consideration could be taken when correcting the mandibular discrepancy to attain a more patient pleasing result. The male profile with a bi-maxillary protrusion was perceived to be the least attractive by all the non-expert groups. Yet, the same profile was slightly more tolerated; by the same group, when comparing the female profiles. These findings suggest that in an Arab community, a protrusive dentofacial pattern; with protrusive lips is more esthetically acceptable in women. This can be further related to study approaches that dealt specifically with the lip protrusion effect on facial attractiveness; in which similar findings existed. An insightful clinical inference here is that when treating orthodontic patients, it seems more acceptable to leave a female patient with more lip protrusion, than a male equivalent. Further, orthognathic surgeries leading to flatter profiles should be planned carefully. Both expert groups in the study shared similar perception on female profile attractiveness, with no significant differences in the ranking scores. This was not the case for the male profiles; as oral surgeons were significantly less tolerant to retruded chin in males. This variation suggests that a surgical orthodontic treatment plan might require greater consideration and weighing up. Although one would expect general practitioners and dental students to be significantly more aware of their facial profiles than laypersons; yet, our study reports findings similar to Phillips et al.,  and shows that candidates were overall not aware of their profiles. The candidates who perceived themselves as having a Class III (concave) facial profile were the least satisfied about their facial profile. This finding is supported by Gerzanic et al. Contrary to this, Phillips et al. suggested that Class II patients were the least satisfied among all. These differences can be attributed to the sample size, which if was larger would yield to more people of the sample falling into each of the profile types, hence achieving more accurate representation of the population according to the profile type. The average age in our study was 25.71 years and retrospective studies on orthognathic surgeries, such as the Ong's study,  have shown the age range of patients seeking orthognathic surgery was between 17 and 35 and the major reason for seeking such treatment was esthetics; bearing in mind the vast potential for facial profile change associated with orthognathic surgeries. This could mean that, when studying facial profile preferences and self-awareness, targeting the young adult age groups; who seem to be more willing to change their facial profile appearance through orthognathic surgery can be more insightful. This is because implementing the young patient's facial profile preferences in the treatment plan of surgical orthodontic procedures can help in achieving more patient satisfaction hence more successful outcomes. One of the limitations of the study is that the sample did not include orthodontic patients or orthognathic surgery patients. It would be clinically interesting to investigate whether orthognathic surgery candidates in the United Arab Emirates, as well as orthodontic patients, share a similar esthetic perception to the groups investigated in this study. Furthermore, facial profile self-awareness seems to be quite important in these kinds of patients, since their facial profile appearance could be changed drastically; by these treatments. This study on facial profile preferences was limited to the antero-posterior manipulations of the facial profile silhouettes. Although this limitation was critical in influencing the perception of facial esthetics, one study suggested that orthodontists were less sensitive to large vertical changes, compared with laypeople. Further studies can be done to test the group's responses to vertical changes as well. The straight facial profile was perceived to be highly attractive by both expert and non-expert groups. Male facial profiles with bi-maxillary protrusion and a female profile with retruded mandible were considered the least attractive. Lip protrusion was more aesthetically acceptable in females. The female profile esthetic perception was highly correlated between the expert groups. The chin played the most important role in judgment of facial attractiveness by all groups; except for the laypeople; who considered the nose as more influential. Subjects were generally unable to characterize their own profile. Yet candidates with a background of dental education were slightly more self-conscious. Candidates who perceived themselves as having a Class III facial profile were the least satisfied with their profile. Yet, both concave and convex profile patients were more willing to change their facial appearance, compared with Class I profile candidates. 1. Frith C. Role of facial expressions in social interactions. Philos Trans R Soc Lond B Biol Sci 2009;364:3453-8. 2. Borzabadi-Farahani A. An insight into four orthodontic treatment need indices. Prog Orthod 2011;12:132-42. 3. Peck H, Peck S. A concept of facial esthetics. Angle Orthod 1970;40:284-318. 4. Johnston C, Hunt O, Burden D, Stevenson M, Hepper P. The influence of mandibular prominence on facial attractiveness. Eur J Orthod 2005;27:129-33. 5. Romani KL, Agahi F, Nanda R, Zernik JH. Evaluation of horizontal and vertical differences in facial profiles by orthodontists and lay people. Angle Orthod 1993;63:175-82. 6. Borzabadi-Farahani A. A review of the evidence supporting the aesthetic orthodontic treatment need indices. Prog Orthod 2012;13:304-13. 7. Martin JG. Racial ethnocentrism and judgment of beauty. J Soc Psychol 1964;63:59-63. 8. Lew KK, Soh G, Loh E. Ranking of facial profiles among Asians. J Esthet Dent 1992;4:128-30. 9. Cochrane SM, Cunningham SJ, Hunt NP. A comparison of the perception of facial profile by the general public and 3 groups of clinicians. Int J Adult Orthodon Orthognath Surg 1999;14:291-5. 10. Mikawa M, Iida M, Saito S. Clinical and statistical study on jaw deformity patients in the orthodontic department, Showa University Dental Hospital. Orthod Waves 2004;63:49-59. 11. Cox NH, van der Linden FP. Facial harmony. Am J Orthod 1971;60:175-83. 12. Talic N, Alshakhs MS. Perception of facial profile attractiveness by a Saudi sample. Saudi Dent J 2008;20:17-23. 13. Terry RL. Further evidence on components of facial attractiveness. Percept Mot Skills 1977;45:130-9. 14. Hier LA, Evans CA, BeGole EA, Giddon DB. Comparison of preferences in lip position using computer animated imaging. Angle Orthod 1999;69:231-8. 15. Klima RJ, Wittemann JK, McIver JE. Body image, self-concept, and the orthodontic patient. Am J Orthod 1979;75:507-16. 16. Hershon LE, Giddon DB. Determinants of facial profile self-perception. Am J Orthod 1980;78:279-95. 17. Tufekci E, Jahangiri A, Lindauer SJ. Perception of profile among laypeople, dental students and orthodontic patients. Angle Orthod 2008;78:983-7. 18. Johnston C, Hunt O, Burden D, Stevenson M, Hepper P. Self-perception of dentofacial attractiveness among patients requiring orthognathic surgery. Angle Orthod 2010;80:361-6. 19. Mantzikos T. Esthetic soft tissue profile preferences among the Japanese population. Am J Orthod Dentofacial Orthop 1998;114:1-7. 20. Soh J, Chew MT, Wong HB. Professional assessment of facial profile attractiveness. Am J Orthod Dentofacial Orthop 2005;128:201-5. 21. Chung EH, Borzabadi-Farahani A, Yen SL. Clinicians and laypeople assessment of facial attractiveness in patients with cleft lip and palate treated with LeFort I surgery or late maxillary protraction. Int J Pediatr Otorhinolaryngol 2013;77:1446-50. 22. Foster EJ. Profile preferences among diversified groups. Angle Orthod 1973;43:34-40. 23. Phillips C, Griffin T, Bennett E. Perception of facial attractiveness by patients, peers, and professionals. Int J Adult Orthodon Orthognath Surg 1995;10:127-35. 24. Gerzanic L, Jagsch R, Watzke IM. Psychologic implications of orthognathic surgery in patients with skeletal Class II or Class ill malocclusion. Int J Adult Orthodon Orthognath Surg 2002;17:75-81. 25. Ong MA. Spectrum of dentofacial deformities: A retrospective survey. Ann Acad Med Singapore 2004;33:239-42.